We work with an integrative model of theological education that is based upon a biblical and theological understanding of “theology” as loving God and loving one’s neighbour (God’s image) as oneself, which lies at the heart of Pars’ vision and mission for the Iranian Church. In contrast to the Greek and modern understanding of “knowledge” that emphasizes neutrality and detachment, the biblical understanding of knowledge, especially knowledge of God, in both Testaments, grounds it in a relationship or communion of love between God and Man. This relational concept of knowledge is particularly manifest in the biblical use of the word for the sexual relation between a man and his wife. The ultimate New Testament paradigm for knowing God is the mutual knowledge of the Son and the Father in the loving fellowship of the Trinity. In this paradigm, knowing God always results from being known by God. So true Christian theology, and theological education, is based on God’s loving initiative in revelation through his Word, and so is rooted and grounded fully in the Scriptures. It is only in response to this loving initiative from God that the beloved is enabled to respond by loving God and loving his neighbor as God’s image, and thus engage in theology and theological education. The above four teloi, or focal points, define the four general educational goals that Pars’ courses set before themselves. 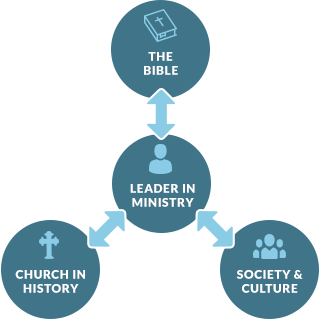 Pars’ mission is to train leaders who aim at progressing towards these goals in their own lives and who are trained to help the church do the same in an effective and holistic way. 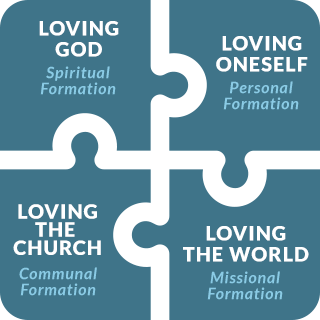 The Biblical concept of love includes all the three dimensions of cognitive, affective, and behavioral, and so Pars’ courses also intentionally target all the three dimensions of the students’ pursuing of love in the four fundamental directions: God-ward, Self-ward, Church-ward and World-ward; hence, the emphasis on formation. Pars’ courses differ as to the number of different elements of the grid included. No course can include all and give enough or equal space to all. But it is important that a number of appropriate elements are carefully chosen to be included in a specific course, so that the teacher makes sure that they are addressed in the actual preparation of the lessons. We suggest that 6 to 8 elements would be a good guideline. These elements are then distributed between the lessons. It is the responsibility of Pars’ academic leadership to make sure that a good balance is achieved in the curriculum as a whole. Biblical Lens [Exegesis of the Biblical Text]: The student is helped to see how and to what extent God’s revelation in the Bible sheds light on the specific focal point being studied, e.g. how the Bible helps us understand and appreciate God’s Triune nature and its relevance for Christian life and ministry. Historical/Theological Lens [Exegesis of the Church in History]: The student is helped to see how the church and its great teachers have reflected on the specific focal point being studied, e.g. how Augustine’s or Basil’s or Moltmann’s reflections on God’s Triune nature can help the student understand and appreciate the nature and significance of this doctrine for Christian life and ministry. Socio-cultural Lens [Exegesis of Culture in Context]: The student is helped to see how the disciplines of Philosophy, History, Literary Studies, Sociology & Social Anthropology, and Psychology as such and as applied to our specific context can help us understand and lovingly progress towards the specific focal point being studied, e.g. how Philosophy, psychology, and sociology as such and as applied to our context can help us understand and appreciate the tri-personal nature of the Christian God and its relevance for our spiritual, personal, and communal formation in our context. 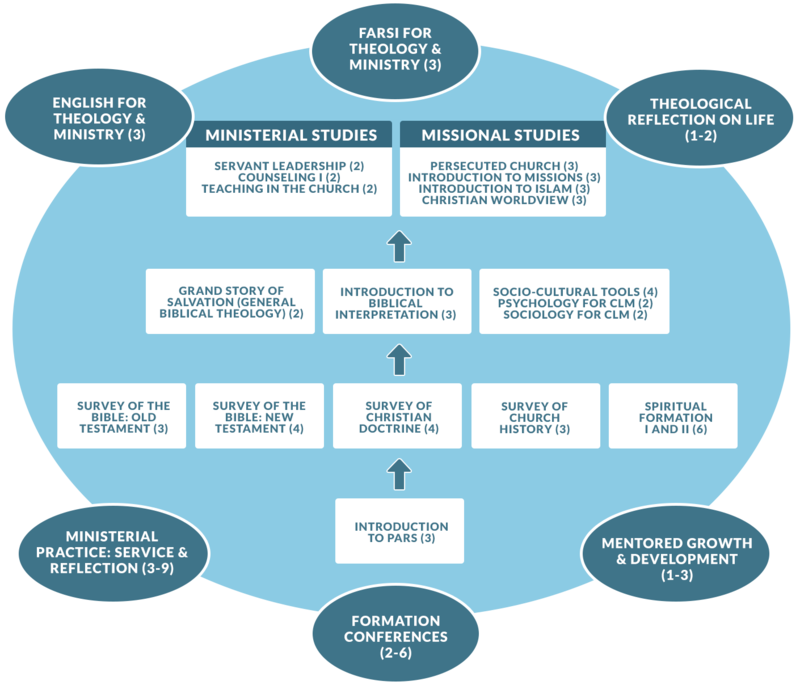 Personal-Ministerial Lens [Exegesis of Self in Ministerial Context]: The student is helped to reflect on the focal point of study in the light of his own personal and ministry experience in context, e.g. how an understanding and appreciation of the nature and significance of the Trinity can help the student in his/her personal and ministerial formation as he makes progress in his pursuing of love in the fourfold direction of God, Self, Church and World, and vise versa. Some of the above lenses will be used in preparing the actual content of the lecture, and some will be used in the student’s own involvement through the Learning Activities and the Learning Tasks. The lecturer responsible for designing, preparing, delivering, and supervising the course makes sure that as many of the lenses that are necessary are used in the developing of each lesson and the course as a whole. Methodological Studies: Here the students gain the necessary knowledge and skill to use Pars’ fourfold lenses of study as they engage in the other types of study at Pars in order to progress towards the overall goals of their training. These courses teach the students to appreciate the significance and benefits of, and acquire the skills for, applying these lenses in their different studies. These courses are specifically designed and prepared to help the students in pursuing the fourfold teloi of their training. For example, the course on Psychology teaches the students how its principles, understood and adopted in the light of the Bible, can help the students love themselves and one another in their studies and later practice of Christian counseling, leadership, spirituality, church life, preaching, pastoral care, ministry to different age groups, etc. These Courses include: Principles and Methods of Biblical Interpretation, Psychology for Christian Life and Ministry, Sociology & Social Anthropology for Christian Life and Ministry, Philosophy for the Study of Theology, Hermeneutics, etc. Biblical Studies: Some courses would focus on the study of a number of different biblical texts with the purpose of pursuing as many of the fourfold teloi as possible, using the different lenses. For example, a course on the letters of Corinthians is taught with the purpose of finding how those letters help us pursue the four goals, using the tools of Hermeneutics, historical-theological study, social sciences, and personal-ministerial reflection. These courses include: Orientation to the OT, NT Survey, Jesus and His Ministry, The Gospel of John, The Book of Torah, OT Prophets, OT Psalms and Wisdom, OT Narrative Books, The Letters to Corinthians, Romans and the Theology of Paul, The Book of Revelation, The Book of Genesis, and others. Historical/Theological Studies: Some courses would study one or a number of theological concepts/themes, focusing on one or a number of fourfold teloi, using the four lenses of biblical, historical/theological, socio-cultural and personal-ministerial reflection. For example, a course on the Person and Work of the Holy Spirit, tries to address as many of the focal points as possible, using the four lenses. These courses include: Overview of Christian Doctrine, Christian Worldview, Christian Ethics, The Triune God, The Person and Work of Christ, The Person and Work of the Holy Spirit, Man, Sin and Salvation, Church History in the West, Church History in the East and in Iran, Cults and Heresies, Apologetics in an Islamic Context, Modern and Post-Modern Theology. Ministerial Studies: Some courses would study in an integrated approach a certain area of Christian life or ministry, addressing one or a number of teloi, using any number of necessary lenses. Depending on the specific focal point(s) of study, the course may train for ministry to God (e.g. Worship), ministry to self (e.g. Christian Disciplines), ministry to (in) the church (e.g. Teaching in the Church) and ministry to the world (e.g. Introduction to Missions). For example, a course on Pastoral Ministries teaches the students how to love their neighbors (here the members of their house group or house church network they lead) by providing them with the pastoral care they need to grow in their faith. They will use all the different lenses of Biblical, historical/theological, socio-cultural, and personal/ministerial reflection. These courses include: Christian Disciplines, Principles of Discipleship Training, Teaching in the Church, Christian Counseling, Pastoral Ministries, Christian Marriage and Family Life, Principles of Preaching, Christian Counseling II, Ministering to Different Age groups, Evangelism and Church Planting, Servant Leadership, Mentoring and Coaching, Management for Christian Life and Ministry.